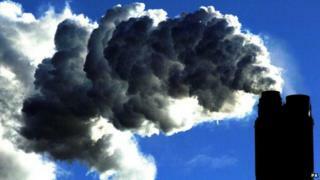 The UK government’s claim to lead the world in cuts of carbon emissions has been challenged by researchers. UK emissions are rising overall because current calculations omit pollution from goods imported from countries like China, Leeds University experts say. But the government says it follows internationally agreed rules on CO2 accounting. The Department for Environment, Food and Rural Affairs (Defra) is to publish the analysis on its website later. But the Leeds report’s authors say the UK’s long-term CO2 targets would have to be tightened if Britain took responsibility for the extra emissions stimulated by the demand from British consumers for overseas goods. The analysis shows that CO2 emissions produced within the UK fell 194 million tonnes in 2012 compared with 1990. But the cuts were outweighed by a rise of 280m tonnes created abroad during the manufacture of goods imported to Britain. At present, the UK is committed by law to reducing CO2 emissions 80% by 2050 based on 1990 levels. The report calculates that if the UK took responsibility for its global emissions, it would need to achieve the 80% cut 10 years earlier - by 2040. And it shows that net traded emissions have doubled in the past 20 years, while emissions within the UK have reduced by 26%. Its lead author Prof John Barrett said: "The government is fully aware that other nations are polluting on our behalf but won’t take full responsibility for the emissions we outsource." He told the BBC that most of the UK's most "carbon-intensive" products were imported, which were a "significant additional burden". Prof Barrett said he did not want to scrap domestic CO2 accounting, but to publish domestic and consumption CO2 accounts side by side. He said this would create a more accurate picture for the Paris climate summit in December of where responsibility for climate change lies. It would also change attitudes in the UK towards goods and materials – ensuring they were not thrown away while they still had a useful life, he claimed. "This is about adding a complimentary approach so we can look at additional policy options beyond just changing the energy system, to changing our lifestyles and tackling the social practices which we all conduct," he said. Prof Barrett said there would be a huge shift in attitudes to motoring. “For most people, a car sits on the tarmac 95% of the time. But Lord Gummer, chairman of the independent advisory Climate Change Committee, which counsels the government and parliament on the issue, said current accounting methods were appropriate. "We have considered using total emission figures more widely, but that would mean emissions being double counted - once in China's total and once in ours. The report says the cheapest way to achieve CO2 savings is for the government to establish an Energy Demand Reduction Target. But Ruth Davis from Greenpeace said: “I don’t think it’s about illusions of carbon cuts or not.